Five programmes recorded live in front of an invited audience: Smart Employment, The Caring Home, Smart Transformation, The Drone Zone, and This Smart Life. 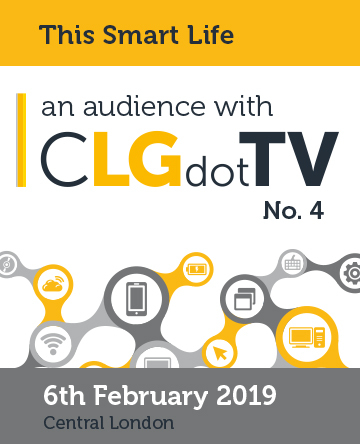 03.00pm - This Smart Life Chaired by Ingrid Koehler of LGiU with guests Darren Capes Intelligent Transport Systems Policy Lead at Department for Transport, Chris Dyer Head of Consultancy at Yotta and Linda Chandler Founder Hyperlocal Cities and formerly Microsoft Smart Cities Lead. CLGdotTV - the public service delivery channel, presents the voice and face of the public sector. More than 110,000 CEX and senior managers in local government, health and social care, the third sector and across all public service delivery channels watched our programmes in 2018. The audience for programmes in our on-going series An Audience With CLGdotTV includes Whitehall department heads, CEOs of local authorities, VPs and country/region heads from multinational companies.